In an ever changing environment agents may come and go, and when it is time for them to go how do you best maintain your support lines of communication? This article describes best practices for maintaining your lines of communication with your customers after an agent leaves your team. The first priority when an agent leaves is to make sure any tickets that were being handled by that agent are maintained by the rest of your team. Ideally, the exiting agent will be able to reassign any tickets that they have assigned to themselves before they complete their time with you. In those cases when the agent isn't able to handle this, any admin will need to reassign those tickets. First, an admin must access the agent's profile by going to Admin icon ( ) > Manage > People. They can then select the Assigned tickets view. At this point they have two options to reassign these tickets. The first option is to manually assign each of these tickets, one by one, to the agents that you would like to take over the tickets. The second option is to bulk assign these tickets to the agent(s) you would like to have take over. This can be done by selecting the check boxes next to the tickets you want to assign and then selecting the Edit(number) ticket(s) button that will appear in the upper right hand corner of your screen. When an agent leaves, you will want to maintain the information of the tickets that an agent has handled in the past. For this reason, you should not delete an agent when they leave. Instead, first downgrade and then suspend the agent's account. This way, in most cases your reporting information stays intact for future reference and any articles posted by your agent will continue to have an agent's name instead of a deleted user as its author. Keep in mind that if you are removing the admin who originally set up your integration between a stand-alone Chat account and Support, downgrading their access may cause ticket creation to fail. Downgrading an agent will delete their personal views and macros permanently. Please also remember to update any app/integration or API request that uses the admin credentials (Authentication for API requests). You'll want another admin to reauthorize these apps before you downgrade the admin. Note: To see authorized apps for a user, click User profile > Security settings > Third-Party Applications. You'll see a warning screen that informs you of the privileges that will be lost by this user if you continue with the downgrade. Verify that this is what you want by selecting Yes, downgrade this user . Once you select this, your agent is no longer an agent and will no longer count towards your agent limit. Note: Simply downgrading the agent does not change your agent count, you will still be charged for the same number of agents until you change your subscription, which can be done by the owner of your account in Admin icon ( ) > Settings > Subscription. Reports that slice via user role can be affected, as the downgraded agent is now an end-user. Report tabs with user filtering enabled will no longer show the downgraded agent in the drop-down. Public reports by the downgraded agent will still be available, but private reports will disappear. Any private reports you want to keep should be saved under an active agent's account. Enterprise customers may want to downgrade an agent to a light agent, then suspend them, to mitigate the impact on their Insights reports. The final step for this process is to suspend the agent's account. This will prevent the agent from logging in to their account going forward. This can be done right after downgrading the agent, within the user profile. Note: Suspending an agent's profile will not not automatically remove them if the number of agent seats is decreased. You must downgrade the agent first. Your agent is no longer a part of your Zendesk Support instance at this point. What is the difference between suspending a user, and deleting a user? I guess should an agent who left be deleted, or suspended? 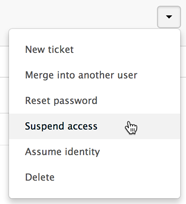 Suspending a user keeps all their information in your Zendesk, but prevents them from logging in. Deleting a user removes their profile completely, although their tickets and Help Center posts will remain. As recommended in this article, it's best to suspend the user, rather than delete them. If I downgrade a user from Administrator to End User will this affect any help centre articles they have published? Will these articles still be available for our end users to view and administrators to edit? Changing the user role is not going to have any impact on the articles those users have published. They'll still be available with the same view/edit permissions. Looking for some advice here. I need to downgrade an agent who left us, and she has 300+ solved tickets that have yet to close. What's the best practice for getting these to a new home, while still being able to report that these tickets belonged to the exiting agent at one point, all while preventing this agent from signing into Zendesk? There are several approaches here; first thing you would want to do is suspend the profile. After that the user will no longer have access to Zendesk. I would suggest when you are reassigning these to another agent you could add a tag, something like - agentName_reassign - this would allow you to create an Insights report filter to report on tickets that used to be assigned to X agent. Terry, that's a perfect solution. Thanks a ton! I hope that somebody can give me a hand with this. I need to downgrade some agents to End-user but before that I'm trying to give their tickets a new home by reassigning those tickets to other agents. Unfortunately, I can't reassign their closed tickets with an automation since according to Zendesk, closed tickets are archived and we can't modify them. What is the best practice in this case then? Can you provide more detail about your use case? It's true that you cannot make changes to a closed ticket. However, you won't lose those tickets once you downgrade those agents. They'll still show up in records and reporting. Update: It's not an option in the drop-down if you click Edit on the list of people, but if you go to their actual profile, it is. Leaving this post up for documentation. I have an agent who was assigned one of our chat positions. I cannot remove the chat capability from his agent profile. I thought it might be because he was suspended so we reinstated his record but it still doesn't work. When I try to downgrade him to an end user the box pops up with the warning and we accept yet it does not change his status. There is an empty box in the right hand corner with a red circle and a red ! in it but no message. After being reinstated the it says that he is a restricted agent. Also, when the agent was in the suspended state it was still counting him as one of our chat agents and not letting me assign the role to someone else. I see one of your colleagues was able to contact our support team and perhaps resolve the issue. If you need any more help with this, feel free to submit a ticket at support@zendesk.com. Perhaps the down arrow should also link to the "edit" functionality. It looks like you are selecting the edit email menu. To downgrade an agent, look for the Role selection higher up the screen. To delete the user, it is a different menu again. This time towards the right hand side. Hi, If I would downgrade a former admin to an end user, will all macros or triggers this admin have created remain or will they be removed? If I want to downgrade 400 agents from Staff to End User, can I use the API instead? Otherwise I will have to do this one by one. I believe downgrading an admin will affect integrations they authorized but not macros or triggers, but I would test it on the Sandbox just in case. We find that when we downgrade Agents to End-Users, all of that Agent's solved tickets get re-assigned to another Agent. Is there anyway to prevent this from happening? We would like to keep those tickets assigned to the Agent for reporting purposes (90% of those tickets will not be re-opened). Hi Kris! There's nothing that'll do that out of the box, although it might be possible using the API. For what it's worth, as long as the user doesn't have access to that email anymore they won't see any notifications, so it's not strictly necessary to remove them. i have several suspended agents who have left our company. (all over 1 year ago) Do i have to delete them to use their seat for new agents? Hi Linda, you dont have to delete them but you have to downgrade them to end users. We find that when we downgrade Agents to End-Users, all of that Agent's CLOSED tickets that are reopened by customers (when they respond to an email after the ticket status changed to 'CLOSE') are getting reassigned to another Agent in her group. We don't want them to go this particular Agent in her group. His first name starts with the letter 'A' so I'm assuming the algorithm goes to the first person in her old group and assigns it to them. Is there a way to create a rule or trigger that assigns these reopened tickets (status = CLOSED) to a specific Agent? @Linda - If you have already demoted these agents to end-users their agent licenses are available for someone else to use. If their Role is still an agent role, you will need to demote them, and then the licenses will be available to be assigned to a new agent. @Janet - I need to clarify the status of these tickets...a Closed ticket can't be re-opened. Are the tickets you're referencing Solved? How did you re-assign the suspended agent's tickets when you downgraded her role? You are right. The ticket was 'Solved', not closed. The agent's tickets were not reassigned. Maybe that's my problem. I did not reassign the tickets before downgrading the agent's role. I think you've answered my question. Sounds like you've got things sorted, but let us know if you have any further questions! If you delete (or downgrade or suspend) an agent who has active tickets using the API, what happens to their tickets? Or does the API request fail?